This Auction contains, outdoor/patio, electronics, appliances, construction materials, home improvement items, home goods, fencing, and more! 12 Cases of 20 Aluminum 6' Double Track for Doors. 12 Cases of 20 Aluminum 6' X 2" X 1" Double Track for Doors. Model PY3011211. Tracks are in nice condition. SABA 54 in. W 47 cu. ft. Two Glass Door Display Commercial Reach In Upright Refrigerator in Stainless Steel, Model: S-47RG. Never used and in very nice condition, Does not come with shelves or casters has two keys. Bottom Mount Compressor. Refrigeration System Holds 33F to 41F. LED Lighting. Stainless Steel Interior and Exterior. Voltage: 115/60/1. Self-Closing Door. Door Lock. NSF Certified. Cools Down Quickly. Measures 54" X 32" X 77"(W/O Casters) Tall. 23 ChoiceDek (Common: 4-in X 4-in x 4-1/2-ft; Actual: 4.265-in x 4.265-in x 4.25-ft) Coastal Redwood Composite Deck Posts 228321. Texture not only looks like natural wood grain, but is also easy to clean. 24 ChoiceDek (Common: 4-in X 4-in x 4-1/2-ft; Actual: 4.265-in x 4.265-in x 4.25-ft) Beach House Gray Composite Deck Posts 221618. 24 ChoiceDek (Common: 4-in X 4-in x 4-1/2-ft; Actual: 4.265-in x 4.265-in x 4.25-ft) Beach House Gray Composite Deck Posts 221618. Texture not only looks like natural wood grain, but is also easy to clean. 23 ChoiceDek (Common: 4-in X 4-in x 4-1/2-ft; Actual: 4.265-in x 4.265-in x 4.25-ft) Harvest Brown Composite Deck Posts 228752. Texture not only looks like natural wood grain, but is also easy to clean. Pallet of 40 Bags of QUIKRETE 70-lb Gray Type- N Cement Mix, Model 100920. Some bags may have rips or tears. Mixed Pallet of Chiselwall Tan/Brown Retaining Wall Block (Common: 4-in x 12-in; Actual: 4-in x 12-in) 604607TAB And Caps. LG 4.3-cu ft High Efficiency Stackable Front-Load Washer (White) ENERGY STAR - BROKEN DRUM, Does not spin. Model: WM3080CW. Severe Weather (Common: 4-in X 6-in x 8-ft; Actual: 3.5-in x 5.5-in x 8-ft) #2 Treated Lumber 11506. 5 bundles of 12 pieces. For optimal performance of paint and stain coatings, allow the wood to dry after installation, and apply a UV protective finish to enhance the long-term beauty. 12 Rolls of Steel Wire Remesh 5-ft x 150-ft; model: 05042. Excellent reinforcement. Two Mean Well 14' X 4' X 12" Customer LED Lighting fixture / Light box - Nice working condition. Two 14' X 4' X 12" Customer LED Lighting fixture / Light box - Nice working condition. Model CLG-15-24. One frame is bent a little on one side, See Photos. Pella 100" X 47" X 7" Wall. Unfinished Casement/ Picture Window. Tan Outside. Pella 100" X 47" X 7" Wall. Unfinished Casement Picture Window. Tan Outside. The end windows open to the outside, Argon filled windows keep the home cool in summer and warm in winter. Window is in nice condition. Large Lot of metal brackets and chains full pallet. Toro TimeCutter Twin Bagger for 50 and 54 in. Deck, Model: 79392. Missing one bag. In nice condition. 6 bushel (8 cu. ft.) capacity. Includes bagger, mount kit and front weight. Large lot of metal brackets and frames, for racking and displays. Scott Living 68-in W Chestnut Infrared Quartz Electric Fireplace 1317FM-33-202 - Cracked corner of mantle. Scott Living 68-in W Chestnut Infrared Quartz Electric Fireplace 1317FM-33-202 - Cracked corner of mantle. Otherwise in nice condition. 1,500 watts; 5,200 BTUs per hour provide supplemental heat up to 1,000-sq ft. Media mantel accommodates up to 80-in flat screen TVs and features 2 drawers, a media compartment and adjustable interior shelves for extra storage, media equipment or game consoles. Thermostat and remote control allow you to easily operate and control heat flow. Did not see remote, but did not open every box. Please inspect before bidding. Duraflame 62" X 16" X 35" Tall W Harbor Gray Infrared Quartz Electric Fireplace 102105 - Missing Parts. 2 Shelves, 2 doors, backing and remote. Has all hardware and is half assembled. Accommodates most flat screen TVs up to 65 inches or up to 90 lbs. 5,200 BTU heater provides supplemental zone heating for up to 1,000 square feet. Duraflame 45-in W Aged Coffee Infrared Quartz Electric Fireplace 102075 - BROKEN BASE. Otherwise in nice condition, with remote. 5,200 BTU heater provides supplemental zone heating for up to 1,000 square feet. Measures 45" X 15" X 40" Tall. Trafficmaster 8 mm. Artificial Grass 6 ft. x 100 ft. - Putting Green Pile. Trafficmaster 8 mm. Artificial Grass 6 ft. x 100 ft. - Putting Green Pile., Model OPP-69A. In nice condition. Perfect for any landscaping, pet areas, medians, porches and patios, balconies, terraces, batting cages and other lightweight portable turf installations, this artificial turf is safe for the environment, Turf is permeable. For Indoor and Outdoor use. 12 Panels of GarageEscape 2 ft. x 4 ft. Paintable Slatwall Easy Panel (2-Piece per Box), Model 5022. 1 Box of 2 easy panels can cover 16 sq. ft. area to form a 2 ft. high x 8 ft. long section or a 4 ft. high x 4 ft. long section of organizational area. These Panels will help to organize a wide assortment of tools, gear, toys, equipment and supplies. Stanley Doors 36 in. x 80 in. x 4 9/16 in. Victoria Zinc Rectangular Lite 2-Panel Prefinished White Right-Hand Inswing Steel Prehung Front Door, 1536A-A-36-R-Z. Door is in nice condition. Double bore. 24-Gauge, hot dipped galvanized steel adds strength to your door and prevents rusting. Polyurethane injected for higher insulation value. From outside, door opens toward the inside of the home with hinges on the RH Side. Cal Flame Island Bar with Double-Burner and storage drawers. Cal Flame Island Bar with Double-Burner and storage drawers. This is one piece of three for the Patio BBQ, Model: E3100. Never installed. The bar boasts a porcelain counter top in tropical cream and brown with stony creek Ameristone stucco base and a solid foot rest with 3 in. bottom trim. Double deluxe side burner with two 15,000 BTU, independent control burners and 304 grade stainless steel construction. Greentouch 33-in W x 26-in H x 10.5-in D Brown Poplar Rolling Fireplace Mantel 1109FM-23-248. Two wheels are broken and the power cord has been pinched, exposing metal wire. Otherwise in nice working condition. 1,500 watts; 5,100 BTUs per hour provide supplemental heat up to 1,000 sq ft. Does not come with remote. 2 Gas Fire Pits, Logs and Accessories - For Parts. There should be enough parts to assemble one, maybe two fire pits. Most of the plumbing is there and the major parts. Also contains two boxes of ceramic logs and burners. Spectra Metals 2 in. x 3 in. x 8 ft. Cream Aluminum Downpipe 8 Pieces. Spectra Metals 2 in. x 3 in. x 8 ft. Cream Aluminum Downpipe 8 Pieces. Model: 3DPCR8. Pipe is in nice condition, some minor scratching and dents. Four 6' X 2" Pieces of Cali Bamboo Fossilized Eucalyptus Mocha T-Moulding. 7104009219. In nice condition. Freedom (Common: 6-ft x 4-ft; Actual: 5.95-ft x 3.83-ft) Conway Sand Vinyl Lattice-top Gate 73025159. Never installed and in nice condition. One of the posts is damaged about 6" from end otherwise in nice condition. Like NEW - Whirlpool 24.6-cu ft Side-by-Side Refrigerator with Ice Maker (Fingerprint-Resistant Stainless Steel) WRS315SDHZ. Never installed and in very nice working condition. Did not notice any scratches or dents. LED interior lighting, Exterior ice and water dispenser. Electronic temperature controls, icemaker, Humidity-controlled crispers, Frameless glass shelves. Measures 36" W X 32" D X 70" Tall. Homelegance Celandine Silver Queen Bed Rails. Head and Foot Boards Not Included. Homelegance Celandine Silver Queen Bed Rails. Head and Foot Boards Not Included. Model: 1928-3. Rails are in nice condition. Sterling Medley 60-in White with Right-Hand Drain, Model: 71171820-0. - Broken Apron. Sterling Medley 60-in White with Right-Hand Drain, Model: 71171820-0. - Broken Apron. Piece is with the tub and can be fixed. No compromise to functionality of the tub. 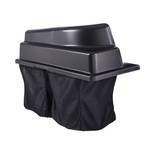 Sleek, ergonomic design, this Ensemble bath provides maximum soaking comfort providing lumbar support and a deep bathing well. Reliabilt Replacement Argon Filled Window for Double Hung Series 3201 - White. In nice condition. Measures 24" W X 17 1/2" T X 1 1/2" D.
Pella Architect Series HIG Casement Window Replacement. Pella Architect Series HIG Casement Window Replacement. In nice condition, never installed. Measures 21" W X 50 1/2" X 2" D.
Pella Portobello Double Casement Window, Oak Finish interior and Brown Vinyl Exterior. Pella Portobello Double Casement Window, Oak Finish interior and Brown Vinyl Exterior. In nice condition, never installed. Measures Approximately 37" W X 54" Tall X 7" Wall. Inspect before bidding. Pella Portobello Double Casement Window, Oak Finish interior and Brown Vinyl Exterior. In nice condition, never installed. Measures Approximately 46" W X 54" Tall X 7" Wall. Inspect before bidding. Sterling Ensemble Medley White Vikrell Bathtub Wall Surround (Common: 30-in x 60-in; Actual: 56.75-in x 30-in x 60-in) 71374800-0. Never installed and in nice Condition. Tongue-and-groove walls with snap-together installation. Solid Vikrell material. Requires item 805823 (tub) or 805822 (tub) to complete the kit. Frigidaire 24-in Stainless Steel Front Control Tall Tub Dishwasher (Actual: 24-in) ENERGY STAR FFCD2413US - FOR PARTS or PROJECT. There is a hole in the base and it leaks. Hole is in inside back left bottom corner - see photo. Sterling Ensemble Curve 60 in. x 1-1/4 in. x 72-1/2 in. 1-piece Direct-to-Stud Back Shower Wall in White, Model: 72232100-0, In nice condition, never installed. made from solid Vikrell material for strength, durability and lasting appeal. Back wall only. Tongue-and-groove modular design. Style Selections TAO 60 x 32 Acrylic Shower Base Floor White Square Left Drain White Acrylic Shower Base 31.875-in W x 59.875-in L with Left Drain SB016032L. Never installed and in nice condition. Wall surround kits 805788 are sold separately. Textured anti-slip area and easy to step over 2.5-inch threshold. Compatible for tile. 2 ReliaBilt Classics White Louver Wood Pine Bifold Doors With Hardware (Common: 36-in X 80-in; Actual: 35.5-in x 79-in) 364368. Both Door Kits have scratches and some dings, but overall in nice condition. Track and hardware included for easy installation. Sterling Sterling STORE PLUS 60" Shower Backwall, 72332800-0. Sterling Sterling STORE PLUS 60" Shower Backwall, 72332800-0., Never installed and in nice condition. Requires items 786118 (Backwall) and 786122 (Endwalls) to complete the kit. When complete alcove has adjustable corner shelves which maximize showering space. Including four rimmed shelves, two large bins, two shower hooks and two soap dishes with towel bars. Shaving ledge/foot rest added for comfort. 7 Fiberon (Actual: 3.5-in x 4-in x 6-ft) Deluxe 2-Pack White Composite Deck Handrail Model: RL PK 72IN DEL ST WH. Never installed and in nice condition. Kit includes 6-ft top and bottom rail routed for stair installation. Strong, low-maintenance composite railing system; easy to install. Brackets and Balusters sold separately. Pallet of Primed Moulding, Different Sizes and Lengths. 8' and 12'. There are Base Board mouldings and Rail moulding to cover seams on projects or raised panels on cabinets and doors. Weatherstar ClimateRite 32" X 55" 2 track Storm Aluminum Window. Model: C2033255. In very Nice condition, Never installed - The frame is made of durable aluminum with a high-gloss white finish and comes with hardware for installation. features a bottom panel with adjustable ventilation stops. 2 GE Holiday Classics Silver Glittered Snowflake Tree Topper, Model: 71241HD - Broken Tips. Opened and tested, Each start has one broken Snowflake tip. 19 long-life General Electric bulbs illuminate the topper for lasting use. Snowflake is 11".